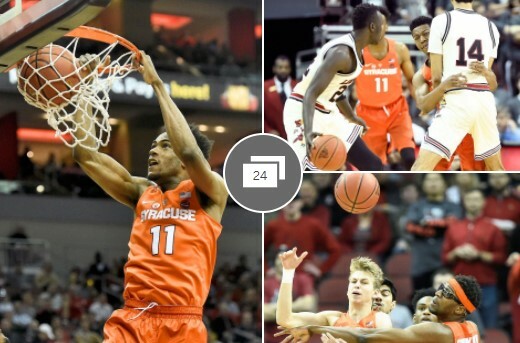 Louisville, Ky. -- The Syracuse Orange squandered nearly all of a 12-point second-half lead, but managed to hang on for a 78-73 victory over the Louisville Cardinals here at the KFC Yum Center on Monday. Syracuse led 65-53 midway through the second half only to see Louisville cut that margin down to two points. But in the final minutes, Syracuse got some clutch plays from guard Tyus Battle to hold off the Cardinals. Battle finished with a game-high 25 points for the Orange. He scored six of SU's last nine points. Syracuse improved its record to 16-8 overall and 5-6 in the ACC. Louisville fell to 16-8 overall and 6-5 in the ACC. The Cardinals have lost four of their last five games. Syracuse guard Frank Howard added 22 points, while Oshae Brissett hit for 16 points. A Syracuse flurry got the Orange to 65-53 with 7:36 remaining. Howard buried a 3-pointer with 1 second left on the shot clock. Howard then slashed to the basket for another two points. Battle came back with a jumper and two free throws. At that point Louisville was 3-for-17 from 3-point range. The Cardinals abandoned the outside shot in favor of its two big men. Ray Spalding and Anas Mahmound combined on Louisville's next 12 points as the Cardinals closed to within 67-65 with just under four minutes remaining. Syracuse went over five minutes without making a field goal during Louisville's rally. Inexplicably, Louisville abandoned its inside attack. The Cardinals took and missed 3-pointers on three of their next five possessions. That allowed Syracuse to find its composure. The Orange led 39-33 at halftime. Syracuse's offense, so stagnant of late, got a boost in the first half as Louisville committed nine turnovers. Syracuse turned those miscues into 16 points in the first half. The 39 points were a far cry from Syracuse's recent first-half performances. In its last three games, Syracuse's halftime totals were 22, 21 and 21. Howard and Battle combined for 24 points in the first half. Howard scored 13 points on 4-for-7 shooting, while Battle had 11 points on 3-for-7 shooting. Battle went 5-for-5 at the free-throw line. Howard broke out of a mini-slump with 22 points in the win over Louisville. Howard's 22 points were the most for the junior guard since he scored 23 in SU's loss at Wake Forest on Jan. 3. Howard was 3-for-22 from 3-point in SU's last three games. He went 7-for-15 from the field and 3-for-5 from the 3-point line against the Cardinals. Brissett was having a great game until he committed his fourth personal foul with 16:56 left in the game. When he went to the bench, Brissett already had 14 points. He had scored seven points in the first four minutes of the second half. Brissett re-entered the game with 10:20 remaining, but he wasn't effective while saddled with four fouls. He eventually fouled out with 1:26 remaining, finishing the game with 16 points on 4-for-9 shooting to go along with eight rebounds. Syracuse freshman Bourama Sidibe's injured left knee prevented him from playing on Monday, leaving the Orange with just six healthy scholarship players. It was the second straight game in which Sidibe couldn't play. He sat out Saturday's loss to Virginia. Sidibe has now missed seven of SU's 24 games this season. Sidibe had appeared to be improving recently. He had 18 points and 16 rebounds in a win at Pittsburgh. He played 31 minutes in that game. Syracuse led 39-30 and had the ball with time running out in the first half. At worst, the Orange should have taken a 9-point lead into the break. Instead, two mistakes cost Syracuse. First, Braedon Bayer, a former walk-on who was pressed into duty as forwards Marek Dolezaj and Matthew Moyer picked up three fouls, traveled with 2.7 seconds remaining. Louisville was inbounding the ball on its side of the half-court line, but SU's guards didn't cross over half court to offer any resistance. Louisville guard Darius Perry got the inbounds pass as he headed upcourt. Perry got a free look at the basket as he crossed the center-court line and buried a 3-pointer. The last-second trey cut SU's lead to 39-33 at halftime. Greg Paulus, who grew up in the Syracuse area and attended Christian Brothers Academy, is currently an assistant at the University of Louisville. Prior to this season, Paulus was an assistant at Ohio State until former Buckeyes coach Thad Matta resigned last spring. Paulus, who played basketball at Duke before transferring to Syracuse where he played football as a fifth-year senior, spent several minutes before Monday's game chatting with SU's radio broadcast team of Matt Park and Jim Satalin. Paulus and SU assistant Eric Devendorf both played in the 2005 McDonald's All-American game. Syracuse will have some time to rest and recuperate before its next game. The Orange has the rest of the week off before hosting Wake Forest at the Carrier Dome on Sunday. Wake Forest is 9-14 overall and 2-9 in the ACC. However, one of the Demon Deacons' ACC wins came at Syracuse's expense. Wake Forest knocked off the Orange 73-67 in Winston-Salem, N.C., on Jan. 3. The Syracuse-Wake Forest game will start at 1 p.m. and will be televised on the ACC Network. 0 Response to "Syracuse basketball gets crucial road win at Louisville"